Super Deluxe buses are non-AC buses with Air-Suspension and 40 push-back executive seats. All the existing Super Deluxe buses were built by KSRTC's Central Workshop, on Ashok Leyland Viking 222" WB Chassis. These buses feature sliding glass windows, and a single entry/exit door. As evident from the image above, the buses lack a very important 'feature' - Attractiveness. The bus looks like a badly built contraption, which no-one would in their wildest dream think is an Air-suspension bus. The interiors are pretty decent, and the seats are comfortable. There is no partition between the driver cabin and the passenger section - this results in light from oncoming vehicles directly flashing on passengers' faces. The "AC" buses used currently by KSRTC are the first generation TATA Globuses. The buses were built by ACGL, on TATA 1616 Chassis. These buses have a fixed glass, and are airconditioned using Thermoking overhead AC units. The buses have 45 seats, all with push back facility. The seats are regular ones, and do not have thigh support. These buses are maintained poorly (as evident in the image above) - more than maintenance, the bus itself is of poor quality. Yours truly was "un"lucky to have traveled in one of these just 3 months after they were introduced - the buses rattled badly and the ride was no where near being called "comfortable". One gets to know each rough patch on the road very clearly inside the bus. The Airconditioning in most buses are faulty, and buses are often cancelled due to fault in the AC system. Leakage has been an issue with these buses since a long time, and the media had recently highlighted the issue. 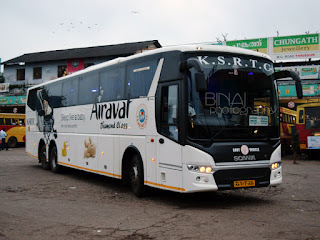 An "AC Garuda" bus.. Its a Volvo 9400.. The "AC Garuda" are Volvo 9400 buses. KSRTC operates three such buses - but has suffered seriously from reliability issues. Given the less number of buses, there has been increasing incidence of service cancellations, with the scheduled bus going to the workshop. There has also been incidence of certain antisocial elements disrupting the services by stone-throwing and other damaging measures. Why are these services proving a debacle? This is the million dollar question for KSRTC. The premium services of KSRTC (56 buses in all) form only a shade more than 1% of the corporation's fleet strength (of 5556 buses). The main reason why most services fizzle is reliability - service cancellation without any information is the norm in KSRTC these days. 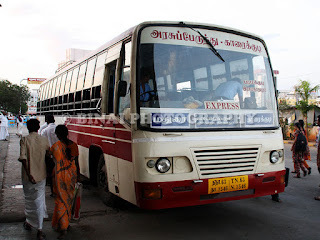 In a recent incident, the Ernakulam-Trivandrum Volvo service was cancelled, and no information was provided to passengers who were waiting for the bus for a long time. Not only that the bus was cancelled, no alternative was provided. What ensued was a mad rush for the buses that came later, and at least a handful of passengers who would think twice of planning to travel by these buses. 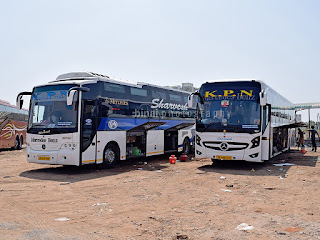 Reservation is not provided on a substantial number of these services - the reason why they are kept off the reservation system is: KSRTC is not sure if the bus would run. Providing reservation would mean refund of the money to passengers, and also bearing associated losses. The Trivandrum-Palakkad AC service was recently taken off the reservation system. The reason: The scheduled bus spends more time at the workshop than actually running! AND, KSRTC has no spare bus as a back up! Of the 56 'premium' buses with KSRTC, only a handful operate on intra-state routes. Others are on Inter-state routes - to be more specific, on the Bangalore route. While private operators run AC buses out of Kerala on many lucrative routes, KSRTC is still to wake up and run buses - its good that they don't start another unreliable service. Purchase more buses, from reputed manufacturers. There should be adequate spare buses for each class of service. Introduce more such services so that they are more visible among passengers, and have more recall. Introduce reservation on all such services - this forces a level of reliability. There are more ways of improving the service.. it is just that the authorities should wake up and dare think beyond introducing more and more ordinary services. Make a humble beginning by replacing long distance services with premium services - nobody with a sound mind would decide to travel from Kottarakkara to Mookambika, or Trivandrum to Mangalore by a Super Fast bus. Introduce a premium service, and encourage people to upgrade.